Judy has asked me to help out with an on-line clinic in which we'll cover some exercises and philosophies from Bill Dorrance's book "True Horsemanship Through Feel." The book is outstanding and a wonderful resource. To participate in the clinic though, you don't need to buy the book. We are lucky enough to have excerpts from it on Leslie Desmond's web site and we can read them there then discuss them. We will begin the clinic on Monday with a little question and answer about feel. What is it? Why is it important? What are the different types of feel and why are they important? We'll talk a little bit about some of the vocabulary I'll be using and then we will begin the exercises. We'll cover one or two a week depending on how people are progressing and what type of discussions develop. This is alot of fun and I welcome and encourage your thoughts and opinions. Don't be shy about asking questions or if you don't understand my answers on occasion. I may need to rephrase things and I don't care how long it takes to "hash things out". As my good pal says, "Everything is of equal importance to the horse so it is of equal importance to me." You bet! You can do these exercises with babies or senior citizen horses-they are all open to feel. Feel is what the horse understands best. Just about the time he hits the ground his mother already begins to teach him about feel. Feel is the most basic and natural thing that a horse understands and they all understand it, no matter the age. This is a good question because on the reverse side, people might ask, is my horse too old? He's an old campaigner and pretty set in his ways. This does not matter. We may have to take a little different tact at times and problem solve a little, but ALL horses understand feel. A halter (web or rope) and a 12' lead. It's important to use about a 12' lead because we want to be able to have enough rope to let the horse move freely. If the rope is too short we might inadvertently have the horse run into pressure at the wrong time simply because it wasn't long enough. The longer rope will allow for freedom of movement. If you're not used to a longer rope, just practice handling it a little. It might feel odd at first compared to the shorter ones, but with time, you will get good at handling it and I think that you will grow to appreciate it! There is a section on commonly asked questions that you'll enjoy and then the exercises follow. We'll call the clinic "Making the Change" and MTC will appear under the subject heading and what we will be working on in that section. Thanks alot for allowing me to talk with you about your horses in the coming weeks and I look forward to your input and ideas! 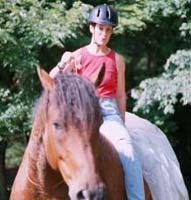 Nancy & Dan (Dan is not an Icelandic, but another cold blooded horse, an American Curly. He's been a great teacher to me in learning these exercises and I will use him in several examples during the clinic). First off, you don't have to spend alot of time each day on these exercises. If you commit yourself to ten minutes a day even, earnestly working on these things, you will make great strides. I think that the ultimate learning strategy is to work with your horse for short periods, several times a day, with two or more hours break in between. The work is short, but of quality. It's not going to become boring (and hopefully you won't get cold) and if you are able to work more than once a day, the break in between is a good sort of digestion time for the horse to understand the information. It also gives you, the human, time to regroup and look at what's working and what's not and then decide if you need to make a change in your presentation. Also, you don't need alot of room for this stuff. You can do alot in the barn or even the stall. I've done it and it works! I like to spend alot of time with my horse and I enjoy the winter very much. I know that not everyone feels that way about snow though! You can always save the posts for the springtime but then you'd miss the opportunity to ask questions and troubleshoot. Monday, gee, that's tomorrow! I will post a little discussion about feel-this is the main thing that we will be working with and trying to improve upon. We'll do a vocabulary section so that some of the terms I'll be using make sense to everyone. Some people may never have heard some of them before. Then we will start the exercises based on the ones Bill Dorrance chose in his book, 'True Horsemanship Through Feel'. We are able to read them on Leslie Desmond's web site (which I will post with every exercise) so that no one needs to buy the book. It is spendy, but a good investment IMO, if anyone is interested. I'll add parts to the description when needed and answer questions. Hopefully people will include their insight and ideas and add to the discussions. I look for the format and posts to be very friendly and hope that everyone will feel comfortable participating. I would really encourage people to work with their horses as we go through the clinic. It's a good support system and alot of fun. Thanks, and I'll look forward to hearing from you again. We can adjust anything! I will always be ready to answer questions about any exercise at any time. As we go along, people and horses are going to get the hang of all of this at different rates. All you have to remember is to take the time it takes. It doesn't matter how fast the other guy goes. Some exercises seem easy to certain horses and people, then they get stuck on the one that comes up next. They are all like building blocks that you are creating a nice foundation with. Each block has to be sturdy and good because all of the others are depending on the previously laid ones. Some will just take more time to become "foundationally sound" and horses are just as different from each other as people are so everyone is encouraged to go at their own rate of speed. Just make sure that your work is quality. You will notice nice changes by working with your horse a couple of days a week so don't worry! There are ideal situations, but that's usually not the cards that we are dealt! You gotta live your life! You can always print the posts or check the archives too though. Judy may already have a special spot all staked out where you will be able to easily find them! You will do really well because you have the desire to do it and there is no need to ever feel left behind, okay? Oh yeah, remember too, have fun! Tonight I'll talk a bit about the equipment that is most ideal for the clinic. Tomorrow, a little discussion on "feel". Thursday: vocabulary words and in the following days we will begin our first exercise! As I mentioned in by first post, the equipment that you will need for the clinic is a halter and lead rope. The halter I prefer is a rope one. You CAN use a web halter or leather halter, but I think that the most effective halter is a tied rope halter. Why? Because it is a precision tool. It is also very light and should give the horse the feeling that he is wearing nothing but the rope halter gives a very direct cue that accepts a soft feel. The rope halter "reads" the cue faster than a web halter by virtue of it's narrowness and the knots and where they are tied. It takes very little effort to direct a horse with a rope halter. This is a good point to remember if you are just switching over to a rope halter-it takes less to do more, so adjust your cues accordingly. The horse is less likely to lean on a rope halter. A rope halter can have a bite to it, I won't kid you about that. It affords more control but is also a very subtle tool. "Horse Journal" had a nice review on rope halters recently. We can talk about web vs rope halters and although I feel that your training techniques and your feel is the most important thing, and that the type of halter that you use should not hinder you, I thought I'd relate some of the points that the article made regarding rope halters. The article is called "Tied Rope Halters Make A Difference In Training." Under Unique Characteristics of rope halters: "Tied rope halters allow subtle communication with the horse by virtue of their design. They capitalize on the horse's sensitivity by providing: smaller bands of pressure than leather or web halters; small point stimulus with the nose side knots; a predictable, regulated unit through their carefully chosen stiffness and balance. "The training premise of "release as the horse responds" can be employed to great advantage....tied rope halters encourage the sensitivity and lightness we want in our horses on the ground. They are thin enough to get a horse's attention, discourage the horse from leaning on them and for quick and simple corrections. While groundwork can be accomplished with a nylon or leather halter, the strong basics and subtle, specific exercises employed by natural horsemanship trainers are more easily accomplished in a good rope halter." Linda asked me about the length of the lead rope recently. The ideal length is at least 10'. Anything shorter can hinder the movement of the horse that you are asking for in the exercises. If you run out of rope before the exercise is complete then you will be sending the wrong message to your horse. Of the two, I think that the 10' lead is essential. If you can only afford one thing, get the 10' lead. You can use longer ones if you like, but make sure that they are at least 10' long. If you have never used a longer lead take the time to get comfortable handling it. Practice coiling and uncoiling it and how if feels in your hand. I prefer a cotton lead. Some people ask if they can use longe lines. Well, you can, but they are not as effective as a cotton lead. They fall and hang differently than a cotton lead. And the nature of the flatness of some longe makes them move differently. They lack a quality that transmits your feel-your conversation with the horse, through the lead. I hope that by the time the clinic is over that everyone will be able to understand and relate to that. I am a firm believer though that you can adjust feel to anything. So if you are on a budget, don't worry, use what you have. It will not limit you if you don't have certain things. We can discuss problems that you may encounter with any of the equipment that you might be using.